These deep chocolate cupcakes surround coffee buttercream filling and are topped with silky Irish Cream buttercream. They're sophisticated, worldly, and adults-only. Heat the oven to 350 degrees F and line a 12-cup cupcake tin or muffin pan with papers. To make the cupcakes: Place the flour, cocoa, sugar, butter, eggs, salt, baking soda, baking powder, vanilla and chopped chocolate (if using) in the bowl of your mixer. Blend on low speed for 1 minute, just to combine. Combine the coffee and Irish Cream liqueur and pour half this liquid into the dry ingredients. Blend on medium speed for 2 minutes. Scrape down the bowl and add the remaining liquid. Beat on medium speed 1 more minute. Scoop the batter into the prepared wells of the pan, filling them 2/3 full. Bake for 15 to 18 minutes, or until a toothpick comes out clean. Immediately remove the cupcakes from the pan and set them a rack to cool. 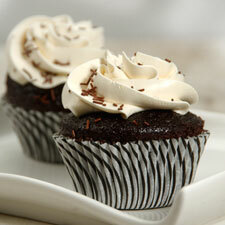 While the cupcakes are cooling, prepare the coffee filling and Irish Cream buttercream. Dissolve the espresso powder in the water, then whisk into the 1 cup buttercream. This may take a few minutes, so be patient. Repeat for the Irish Cream buttercream, whisking the liqueur and flavoring into the 2 cups buttercream. Set both aside. When the cupcakes are cooled, core out the center with a cupcake corer, or an apple corer, being careful not to cut through the bottom of the cupcake. Pipe the coffee filling into the center of each cupcake, filling to the brim. Finish each cupcake with a piped swirl of Irish Cream buttercream. A few chocolate sprinkles or mini chocolate chips make a nice topping.